Information appearing on engineersedge.com is the copyright of Engineers Edge You are not permitted to copy, broadcast, download, store (in any medium), transmit, show or play in public, adapt or change in any way the content of these engineersedge.com web pages for any purpose whatsoever without the prior written permission of the Engineers Edge authorized staff. Users of Engineers Edge are permitted to screen print a single copy of a web page for personal use. Engineers Edge endeavors to ensure that the information is correct but does not accept any liability for error or omission. 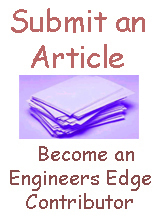 Many of the reports, articles and web pages on engineersedge.com and other Engineers Edge web sites include links to external web sites. These links are included to give you the opportunity to explore an topics in more depth. Engineers Edge is not responsible for the content of these Internet sites.For information about copyright laws please visit www.copyright.gov/. Copy Infringement Information on Engineers Edge Forums etc.